Ah, the torch of West Coast Rap. It was probably lit before anybody even knew it existed, just a wee little flame. It’s been passed down for generations, arguably with Dr. Dre at the constant forefront of it each and every step of the way, from World Class Wreckin’ Cru to NWA to The Chronic to Snoop Dogg to 2Pac, back to Dr. Dre for Chronic 2001 to The Game and now…Kendrick Lamar. The kid’s buzz speaks for itself, and his much-awaited debut studio album good kid, m.A.A.d. city is finally upon us, and Kendrick to show us how much can change through one’s transition from starving independent artist to major label superstar. In his case? Thankfully, not that much. The west coast sound is captured pristinely with various synthesizers akin to west coast classics weaved throughout the album, which enjoys production from the likes of Sounwave, Scoop DeVille, Just Blaze and Pac Div. Most beats have a darkness to them, a seediness even; tracks like The Art of Peer Pressure, good kid, and m.A.A.d. city have movements in which the beats transition, oftentimes into something more ominous than their predecessor. Save for drum arrangements that we have heard recycled x times over, the production altogether provides the score to what is ultimately a highly cinematic album, thanks in enormous part to how animated Kendrick’s content, lyrics and delivery are; it all plays out like a classic John Singleton film. Granted, we have heard some of these hood stories before, and the album as a whole doesn’t stray too far from his indie effort Section.80, so Kendrick doesn’t get top marks for originality, but his deliverance is enough to keep it sounding as fresh and new as possible. If you’re not accustomed to Kendrick’s velvety voice, equally smooth flow and lyricism which doesn’t necessarily require deep analysis, keep reading. He doesn’t necessarily spoon-feed you, nor turn into an effort of migraine-inducing deciphering on your part; instead, it is crafted in such a way that simple concepts of the human condition (despite the stories mostly taking place in Compton) are communicated with ease whilst respecting the listener’s intelligence enough to not have absolutely everything in base form. It is also his perpetual attention to detail in his lyrics that breathes fresh air into the familiar stories found within socially conscious rap music time and time again. 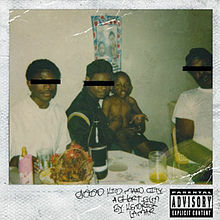 good kid, m.A.A.d city is dark, seedy, and nearly masterful in Kendrick Lamar’s execution of exploring familiar grounds; though the subject matter is nothing new, the approach Kendrick takes in delving into it is unabashedly gripping. Bringing along guests Drake, Anna Wise, MC Eiht, Jay Rock, and of course Lamar’s mentor Dr. Dre along for the ride brings the tracks some peaks and valleys but in no way detracts from the overall quality of the album, strangely enough. So be a good kid. Buy this. You may also want to have a peek at these reviews: Lupe Fiasco, The Expendables 2, Slaughterhouse.